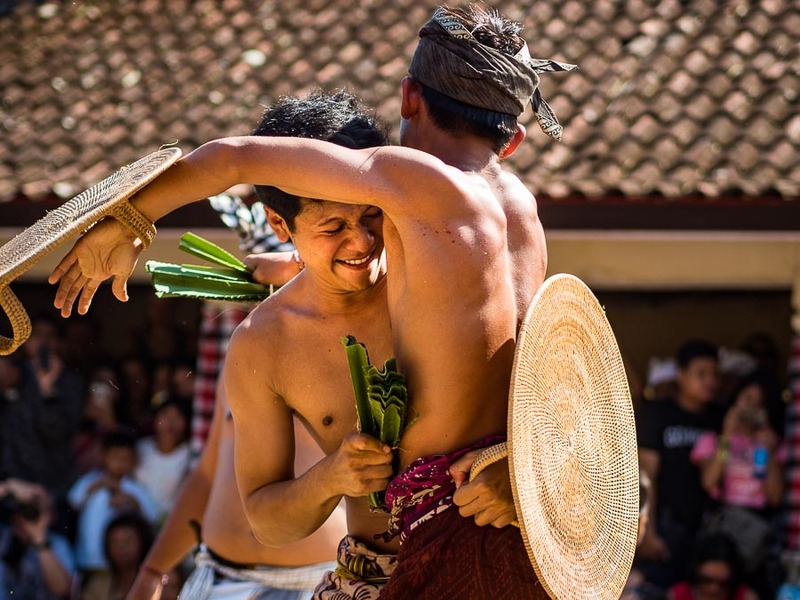 Young men do battle with thorny pandanus leaves in Tenganan village on the eastern end of Bali. 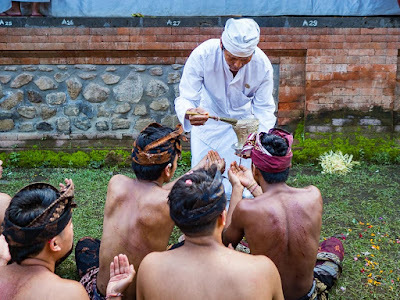 The last ceremony I covered in Bali was the Pandanus War Ritual in a village about two hours from Ubud. It was unlike anything I've ever seen. 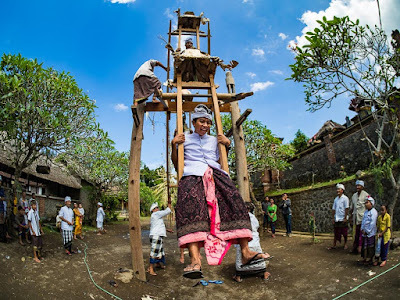 Tenganan village itself is not that different from any other village on Bali. The people are Hindus, each family compound has a small family temple. There are a couple of larger village temples in the community (priests bless the combatants and lead services at the temple but the fights are not a part of the temple ceremony). But the fights themselves are unique. 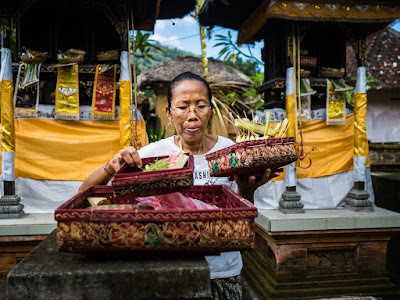 A woman makes an offering in a small family temple. The day started typically. We went to the village and were invited into a family compound, where girls were getting made up and a woman was praying in the family temple. 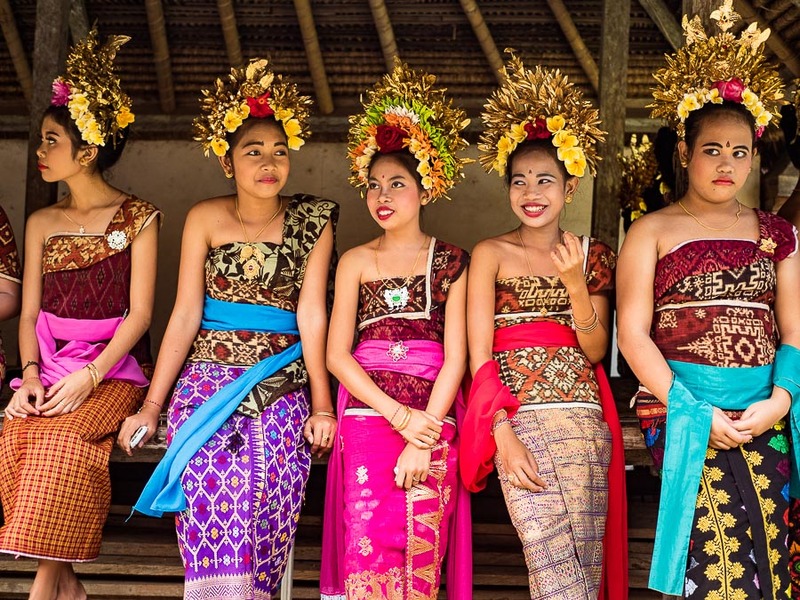 The girls were getting into the traditional make up and attire of Balinese dancers but they weren't dancers. They were extraordinarily well dressed spectators. Men ride a home made manually powered ferris wheel on the main road in town. There were a couple of vendors and games of chance on the main road leading up to the fight grounds, and I photographed it all. The main event, though, was the pandanus fights. Hundreds of men, preteen to senior citizen, gathered at the stage while nearly as many beautifully dressed young women gathered in view areas. 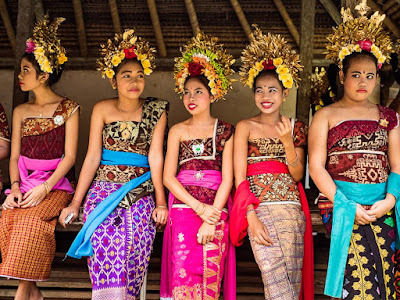 Women in traditional outfits watch the fights. 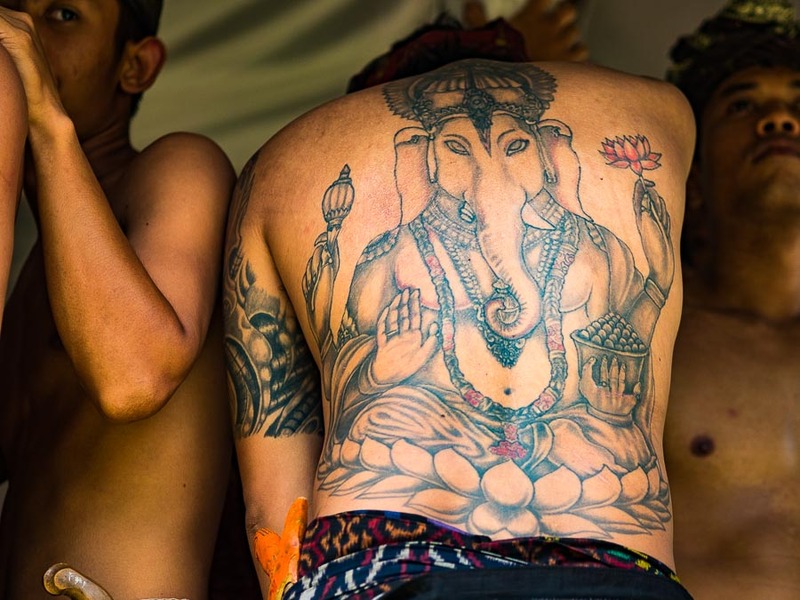 A fighter with a tattoo of Ganesha, the Hindu god known as the "overcomer of obstacles" on his back. 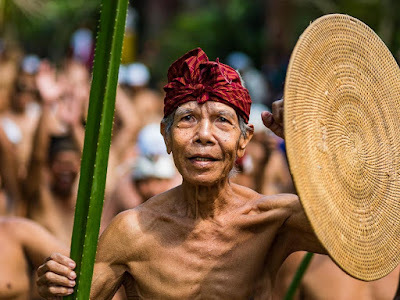 The men came equipped with thorny pandanus leaves and rattan shields. They climbed up on stage and started to fight. 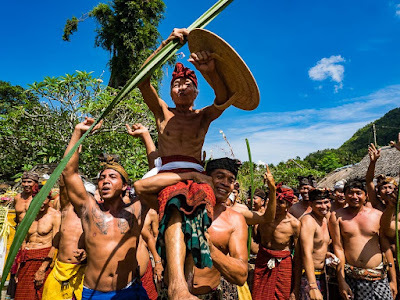 A veteran of pandanus fighting leads his team towards the stage. Before the fights started, one team taunted another. The pandanus fights. Men would meet in the center of the ring (stage) and scratch each other with the leaves. They sometimes jumped on each other and other times would chase each other around the stage. The fights were usually good natured. The fights went on for several hours. They started with two fighters facing off against each other, but as the afternoon went on became more and more of a mob scene. By the end of the fights, there were dozens of men on the stage and while the fights had more of a free for all feel. Eventually the fighting ended and all of the participants sat on the ground around the stage while Hindu priests led them in prayers and sprinkled the fighters with holy water. A Hindu priest sprinkles the fighters with holy water after the fights. There are more photos of the pandanus fights in my archive and available from ZUMA Press.